If your friend asked you to help them move, how willing would you be to help them? If you’re a great friend, maybe you’d say yes with no questions asked – but internally, how much would you really want to help? Let’s be honest, no one likes moving. Now, let’s say that this same friend offers to take you to a nice dinner with drinks after helping them move. The incentive for you to assist them in moving makes the activity a bit more worth it for you. Sure, you are still doing a kind favor for your friend, but you won’t be as bummed about the un-fun, laborious task. The same goes for your employees at work. Although their job is not something you are asking them to volunteer for (they are getting paid), it still helps to create a little light at the end of the tunnel of the regular day-to-day tasks. This is also important for employee turnover. Access Perks reports that roughly $11 billion is lost due to employee turnover. Don’t you think that employee incentives will help restrict these losses? If your business relies on appointments to make sales and acquire customers, then a main priority for your employees is obviously to book appointments. Yet, it may be unclear to inbound call handlers that setting the appointment is truly their most important task is to set appointments. They have other tasks to accomplish as well, so they may start to see themselves as simply “order takers” or just a body there to answer the phone and the callers’ questions. If they properly answered all of the caller’s questions and had a good attitude on the phone, then they accomplished their goal, right? Wrong. If you clearly communicate to your employees that appointment-setting is a crucial metric for them by tracking their performance and creating a contest for your call handlers to see who has the highest appointment-setting conversion rate each month where the winner gets some sort of prize—don’t you think they will try a heck of a lot harder to do their best to set more appointments? 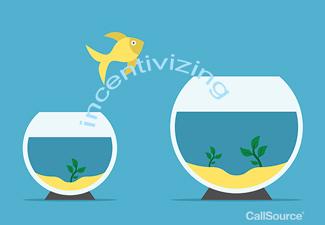 Why are incentive plans important? Check out our incentive stats infographic here. According to DCR Strategies Inc., while “90% of business leaders believe that an engagement strategy could positively impact their business, only 25% of them actually have a strategy in place.” This is surprising since it is also reported that having a valuable, structured incentive program in place can increase employee performance by as much as 44%. What would a 44% increase mean for your business? As noted earlier; it is reported that about $11 billion is lost each year due to employee turnover. Without good engagement and good company culture in the day-to-day workplace, there is a great chance that you will experience a high turnover rate. But having a good incentive plan in place can help. Companies that implemented an official, planned-out incentive or engagement program found a 64% greater increase in employee engagement than companies without this plan in place. Download our free Incentive Plan Checklist here and create the perfect incentive plan for your employees.